I wouldn't recommend this to a friend. The flow of water is extremely weak coming through the faucet. I probably could get a stronger stream of water from my bathroom faucet than this. Even using the spray nozzle is a joke! One of the selling features of this particular faucet was that it is only 18 inches tall. Since my sink is on an island, I didn't want the faucet sticking up and creating a visual block. That is where the good ends. The faucet hangs down so low into my sink that I have trouble getting dishes or my hands under the the faucet and my sink is only 9.5" deep. I often have to lift the faucet from the holder. The faucet handle is also odd in that it comes to the front for hot and to the rear for cold. In my past three kitchens, it has always been the reverse. I really wish I had saved the money spent on the faucet and plumber and bought a well-known brand. I'm just really, really disappointed after remodeling my kitchen to end up with a third-rate faucet. Well built faucet. Got the Stainless Steel. Definitely has an industrial look to it, but would work for most decor. It is not too big especially compared to many of the other faucets of this type. Really love my new faucet and would recommend to a friend. very easy to use. says kraus but overstock says bolden...a bit confused...if they advertise the same look and it's not what I ordered, I have an issue....Overstock used to be thee best 4 years ago; now they are just like other online order entities and I for one am very disappointed!!! The Bolden 18 inch dual functional Commercial kitchen faucet is perfect. I paired it with the Ruvati 33-inch Drop-in Low Platform-Divide Zero Radius 60/40 Double Bowl 16 Gauge Topmount Kitchen Sink - RVH8059. The look is beautiful, the function is awesome. Now I love doing chores ( washing large pots!). 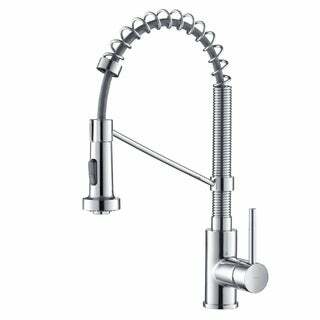 I just absolutely love my Krauss KPF – 1610 Bolden 1 handle 18 inch commercial pull down faucet. It goes so very nicely with my rustic decor and matches not only my stainless steel sink so perfectly but also all my appliances as well. It was very hard to find an 18 inch high faucet with this kind of a restaurant style. As all the other similar faucets are way higher and would not have looked as good in my space Everybody who comes over absolutely loves it and wants to know where I got it from. It looks way more expensive than what I had spent on it and it is very well-made. It’s very well-made and a great bang for your buck and if you want to add that very special a wow factor in your kitchen. Just buyer beware I was told it came with a deck plate and it didn’t and it cost me some grief but Over Stock is helping me by compensating me for having to order another one on my own from somewhere else and having a plumber come back over to reinstall. I know, I know, how can a faucet be gorgeous, but it is! A handyman friend installed it, and he had to buy very inexpensive adapters for the plumbing connections. Although this faucet apparently comes with standard size connectors, the builder of my townhome community allegedly used a specific size for the builder's grade (interpret as cheap) faucet that came standard with the unit. This one is all metal, solid, and works so effortlessly, it's actually a pleasure to use. My 21 year old son and his girlfriend have already been warned not to use this for water fights because the nozzle literally can be turned in any direction! Filling a pot with water is extra simple as a result, but it's also really easy to point the nozzle anywhere else you might be tempted to shoot water. Literally, you can aim at the ceiling! My sink is behind a half-wall open to the dining and living areas, so the upper part of any high arc faucet can be seen from everywhere on the main floor. That meant I couldn't realistically get a standard commercial faucet that could measure two feet or higher, so I am totally in love with this commercial design adapted to an 18 inch height for a residential kitchen. Very impressed with the Kraus brand and this particular faucet. Stunning Faucet. So excited to install this beauty along with our new counter-tops, and will post a photo as soon as the installation is complete! Received insanely fast, and the faucet is of superior quality. At 18-inches, this faucet is the perfect height for our sink, which has an upper cabinet. A lot of these styles are created at 26+ inches, which will not work for our sink space. The Bolden 18” Dual Faucet real nice in my kitchen. My husband installed it while I watched. The instructions easy. All the parts were in the box. I like the shine. It is a pulldown faucet. I like how it works- if I turn on the high-powered sprayer and forget to turn it off, it automatically shuts off when I turn the faucet off and when I turn the faucet back on there is big splash all over the counter top and I can wash a small glass with the low power without splashing water everywhere. I like the hose because it is long and retracts very well. I like that I can move the faucet from side to side to put in very large deep stock pots in the sink to wash. I highly recommend this faucet and would by it again if needed. Works great! Beautiful faucet. Between the quality of the construction and the design, this is absolutely ideal for making tasteful upgrades to older homes. It has the look, feel, and function of industrial type faucets, without the lead concerns or high usage levels and with high level of aesthetics that appeal to most guest in our house. It has precise temperature control like any modern kitchen faucet should have. The high arc spout design gives you plenty of clearance. It’s ideal for doing dishes, filling big pots and watering plants. It swivels 360 degrees, so you can maneuver easily. Installs easily with handy hands and appeases all senses of accomplishment. Highly recommended. Not all the boxes got delivered on time. Only five out of the six boxes that was suppose to be delivered on Monday came, i had to call up UPS and Overstock to find out what was actually going on, because they both are telling me that they have been delivered and it clearly wasn't. I was very upset. As you can imagine. This faucet looks beautiful and expensive. The water spray feature is great! Love it in our farmhouse sink! If you want form and function, you can't go wrong with this faucet. Perfect for a large sink (36") because it can stretch out to all areas. Retractable head makes it even better. Steel braided water line. Very nice!! I just bought a new house and needed a new faucet. I wanted something with that commercial feel, but not too big and clunky. I went with the Matte Black/Brushed Nickel option and it was the perfect choice! This faucet was so easy to install, and it worked perfect the first time I turned it on. The pull-out faucet is smooth and has the perfect reach for my huge sink. I love this faucet!! We just got this faucet installed a week ago. It has a very smooth swivel and ease of use. The pulldown nozzle is very convenient and I live the spray function. The force of the spray is gentle and very effective. Perfect faucet for our new home! Beautiful style and finish is perfect. We could not find what we wanted in our local stores and ordered this faucet and could not be happier with our decision to make this our new faucet. The design is not to big and hose pulls out far enough to reach in my farmhouse sink. Love our faucet. It looks like it is much more expensive. The pull down feature is a little different than I’m used too but so far it has not been an issue. Absolutely gorgeous! I ordered this faucet to update my kitchen. Not only is it beautiful, but it is functional. The matte black looks great against the stainless steel finish. The sprayer is very powerful and the faucet has great water flow. Not to mention it swivels smoothly.